Patrick Neve had a undistinguished 14-race F1 career which was mainly built on one season as a pay driver with Frank Williams in 1977 where his best result was seventh at the Italian Grand Prix. In 1978 he raised his own funded F2 team but it collapsed before the year was out. 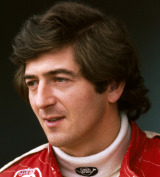 His final outing came at the Belgian GP in 1978 where his privately-entered March failed to qualify.